So, what is a Mortgage Stream? A Mortgage Stream looks and feels like your existing conventional farm mortgage offered by your bank or credit union, but with some key benefits that add value for you. Imagine making your mortgage payments only once a year, after harvest, with canola. The Mortgage Stream offers a competitive alternative to traditional mortgage products. A Mortgage Stream is about unlocking the value in your farmland, putting you back in control of your farm finances. As a farmer, how do I benefit from a Mortgage Stream? Higher loan-to-value than competitors: The same amount of land can provide more upfront cash than with other finance options (up to 80% vs. 50%). Timing of mortgage payment: Your payments are once a year, at harvest and in canola. Minimal annual commitment: Your annual commitment is a very small portion of your canola production. Fixed interest rate: Locked in interest rate in a rising rate environment. Interest rates have gone up five times in the last 18 months. Interest only: The interest-only mortgage keeps the cash flow in your farm while land values rise. Minimum price for your canola: Input takes the canola price risk. Your price is guaranteed for 5 years and is determined at the time of signing. 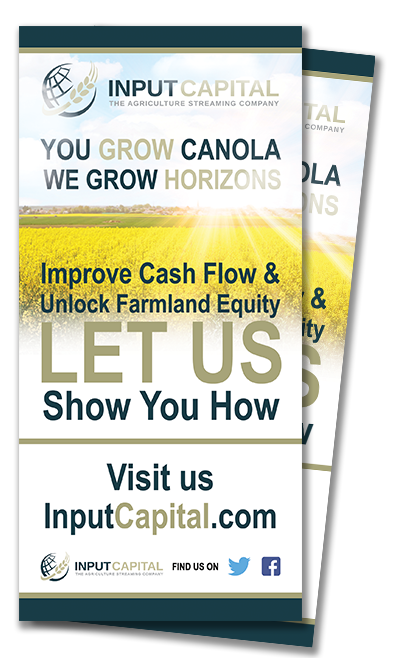 Only Input offers a 5-year locked-in price on your canola. Liquidity: The upfront cash provides liquidity, similar to a mortgage, secured line of credit or interest-only mortgage. Unlock your equity: We place our security only on the number of parcels required rather than a blanket securitization of all your farmland, allowing you to use your equity to your advantage. Expand your farm by purchasing additional land. Restructure your existing mortgages to free up equity locked into low loan-to-value mortgages. Use cash savings to buy your inputs off-season when the prices are the lowest. Take advantage of discounts on large cash purchases. Delivery risk: Any delays in grain handling and transportation are Input’s risk. What happens if canola prices fall drastically during the contract period? A Mortgage Stream guarantees the price for the entire term of the contract. Input Capital takes all the risk if the price drops. Input Capital requires an assignment of crop insurance, for each year of deliveries, equivalent to the annual interest payment on the mortgage document. The Mortgage Stream has a relatively low annual commitment that represents a small portion of your overall production. Does everyone qualify for a Mortgage Stream? There are certain production and financial metrics required for a Mortgage Stream. We require industry-standard information and we secure our interest with a first mortgage position on farmland. What documents do the farmers sign? The main documents are a conventional mortgage, deferred delivery contracts with directions to pay, and crop insurance assignment of indemnity. What are the farmer’s option at the end of the 5 year term? A full or partial payout of the principal or continue financing your land with Input or another financial institution just like you do when your mortgage renewal comes up today. Do the funds have to be used exclusively for land? How does Input Capital determine land values? Input Capital uses an industry-standard comparable sales transactions valuation methodology just like other mortgage providers. What are the fees to the farmer? $1,500 for up to 15 titles with an extra $100 for each title thereafter.